Tears welled up in my eyes, as I read about the devastated lives of tailors during emergency in ‘A Fine Balance’ and about the peaks and valleys dented by partition and politics in Baksh’s life in ‘A Long Walk Home’. Politics indeed seemed a dirty world, out to make lives of common people miserable and hammer out their small joys. But, then I realized that whatever I had read is probably just fiction or at the most faction i.e. fiction based on facts. Perhaps it is far removed from the reality, or at least poetic license had made the stories far more wretched than actually they were in bad times in India, before and after partition. So, I thought why not leave aside fiction for a moment and instead concentrate on the reality. And what better way to understand the real history than studying the autobiography of someone who lived in blood and flesh during the troubled times. Luckily, I had one such book lying in my bookshelf for months now, and at last I picked it up, snugging next to my pillow, to decipher the real world charm. For the uninitiated I am talking about ‘The Story of My Experiments with Truth:An Autobiography’ by M.K. Gandhi, which was first published serially in ‘Young India’, written by Gandhiji in Gujrati, translated into English by Mahadev Desai. I am not a big fan of biographies or autobiographies, and the thing closest to knowing Gandhiji‘s real life, I have read so far is Mahatma vs Gandhi. I read the said book last year, and as was perhaps inevitable, all my sympathy was swayed towards Harilal, Mahatma Gandhi’s eldest neglected son. I teetered under the impression that our Father of Nation, failed miserably as far as his own fatherhood is concerned. However, as I began to read the present book, I realized that every coin has two sides and one should never make a decision by looking at one side alone. 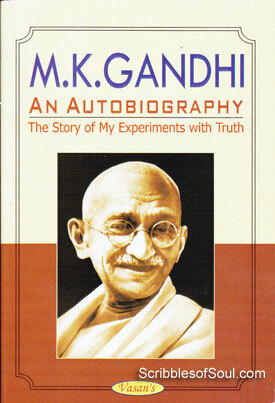 In his autobiography, I chanced to meet the real Mohandas Karamchand Gandhi, devoid of monikers of Mahatma and Bapu. Here, I was introduced to a young man, who is shy, introvert, extremely fearful of public speaking, and yet is able to inculcate a fan following of millions, all thanks to his magnetic persona solely carved out of honesty and sincerity. The book hooked me from the very beginning. Mahatma Gandhi’s realistic ‘My Experiments with Truth’ seemed much more engaging than Stephen Crane’s made up biography of the soldier I had read a few months back. I had always been a hardworking student, and believed that with sound knowledge of Indian History and Freedom Struggle, I knew exactly what role was played by Gandhi. I readily gave him credit for being the leader of mass movement, encouraging common people to believe in the dream of Free India. He did so at a time, when Swaraj was supposedly an elitist dream, with masses having no role whatsoever, in choosing the governance of their own nation, heck, there was not even a nation in sight. But, I vehemently looked down upon his softness, his re-conciliatory nature, his tendency to appear mild and subservient in front of Goras, and always secretly admired the aggressive revolutionaries. However, as I read the present book, I found that whatever credit I had bestowed on Gandhi and the shortcomings I rattled on were out of sync with reality. Yes, Gandhi’s manners were mild, he was in awe of Englishmen and believed in their superiority, he even went to the extent of helping them in curbing the South African Rebels, not even understanding, that the African Aboriginals also had as much right to protest against the cruelty of Raj, as were his fellow Indians. It was strange that Mohandas repeated his mistake of blindly trusting the Raj during the World War I as well and, at one point, I even felt that may be my earlier impression of Gandhi being a paper tiger was right. But, as I read on, I realized that man is a slave of his circumstances. Those times were different. When you grow up under the tutelage of a huge tree, it is but natural to expect the world to end, beyond its shadow. Gandhi belonged to an aristocratic family. His forefathers were treated with respect by Royalties and Englishmen alike. He had never faced the embarrassment meted out to a slave, till he visited South Africa. It was only in that nation that he realized the extent to which English snobbery could descend to. But, Gandhi was an honest reasonable man, and he expected everyone else, even his adversaries to fight honestly, and give them a fair chance. It did back fire at times, though, mostly it helped in gaining sympathy of people even in enemy camps. And, to top it all, he placed his personal issues at back-burner and fought for the general betterment of Indians. As I said before, When I had read Mahatma v/s Gandhi, I had been jolted by the tragedies of Harilal Gandhi, and did believe that Gandhi belittled his own family for country. However, as I finished the present book, I can see the facts more clearly. Gandhi was a fair self respecting man, but once in his youth he had made the mistake of calling upon the favor of a batch mate, he was rudely insulted by him, and thus decided to never take another favor in his life, and he stuck to his principles even when Harilal refused to understand the simple thing. After knowing the real reason behind his moralities, and his open confession, blaming his son’s waywardness on his own moral laxity, my respect for him increased manifold. I admire his strength, and all my resentment has vanished and I am full of praise for Gandhi, for his ability to rise above the mundane familial ties, and understand life in a larger picture. The man was ready to shed his shame in public, without bothering about the bad image it may confer on him. He was in limelight at the time of writing this book, heavily weighted under the monikers of Bapu and Mahatma, his one wrong step could have made him lose people’s respect. Any other man in his position would have never divulged the secrets of his life, fearing public outcry. But Gandhi seems to be made of a different clay. In his autobiography, he is brutally honest. He talks about his stealing gold, eating meat, smoking cigarettes and enjoying physical intimacy with his wife, without mincing words. Although, he also displays his honesty and innocence, when he narrated the episode where he refused to cheat, despite provocation. I enjoyed the political propaganda, Gandhi indulged in while making Khadi and Charkha, emblems of financial and political independence. He appeared to be worldly wise and shrewd enough to garner people’s respect. Though, at times, I felt kinda bored by Gandhi’s continuous expedition with cleanliness and dietary habits. I do feel that he was a bit too attached with these mundane issues, at a time when there were pressing political conditions. But, to be fair, the book is supposed to be his experiments with Truth and I must accept his point of view as sincerely as possible. In all, I am delighted to see that Gandhi was good at amending his mistakes, and I simply wish that the book would have been written after partition, so that we could know what went on inside this great soul, once India did achieve Independence, after incurring a gruesome loss. It would have been an eye opener to know the last words from his mouth. But, as Narayan rightly said once, “Autobiography can never be concluded”. So, we have to be content with whatever is on offer. While I was reading this book, a colleague commented that Gandhian philosophies work no longer and I am wasting my time with this old fashioned book. It is a pity that the said sentiment is shared by millions of Indians today. Given the half baked knowledge of our own history, we do not care to understand that perhaps Gandhi was always an odd man, he never fitted in the general scheme of things, he was a misfit in the society a hundred years back too, with his principles labeled as outdated and nonviable even then. It was simply his belief and confidence that made them work. In the present scenario as well, we need a strong man who is convinced of the efficacy of his philosophies and is able to apply them with as much force, as did the soft spoken, shy Mohandas. As the world fights over the auction of spectacles and a tuft of grass stained with Mahatma’s blood, I drew solace from the 374 pages of his autobiography, which seems to be a mirror image of his soul and mind. If only we could rise above seeing Gandhi as the father of nation, and instead of paying him superficial respect by donning khadi and making him a symbol of currency, if only we could inculcate his honesty and sincerity within ourselves, the country would be a much better place to live in. Till then, at least read the book and be inspired!